Hello everyone! Apologies for the non-existent updates of late - I've been completely swallowed up into wedding planning and all that it entails. Having set a date for much earlier than we both had originally intended, there has been so much to do in a comparatively short space of time. However, much has been done so hopefully I'll be able to resume some semblance of normal posting in due course. Though beware, there may well be a return to many soup posts as the wedding diet commences! My mother and sister came over for an evening to discuss all things wedding-related and as I'd had a delivery of shiitake mushrooms from Abel and Cole, this was the result. It is fantastically light and tastes delicious as the combination of garlic, soy and chilli works so well together. I served this with rice and tenderstem broccoli, which worked beautifully with it. Preheat the oven to 180⁰C. Cover a baking tray with enough foil that it can be folded back on itself to create a parcel, then place the sea bass fillets on the foil. Finely slice the chilli and garlic and slice some of the larger shiitake mushrooms. Mix together the soy sauce and mirin and chop the butter into small cubes. 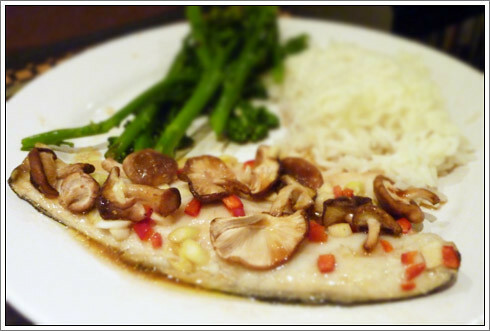 Scatter the garlic, chilli, shiitake mushrooms and butter on the sea bass then drizzle over the soy and mirin sauce. Seal the foil parcel and bake in the oven for 15 minutes. If you’re serving your sea bass with rice, put the rice on to cook while the fish bakes in the oven – they should all be ready at the same time. Enjoy! I've missed your posts, but this one is another cracker :-) Simple and delicious. Wedding planning sounds pretty full on, but I'm sure it will be worth it in the end! the other, slightly larger problem is both my computers are broken - makes photo editing a nightmare & I'm not sure I can bear to do pictureless entries. Hopefully normal service will resume soon enough though - I've got lots I want to share at the moment!